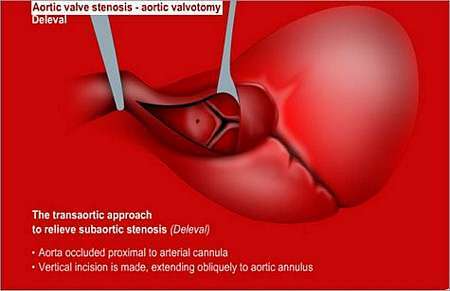 What is CONGENITAL AORTIC VALVE STENOSIS? The aortic valve is the valve between the left ventricle (the lower heart chamber on the left side) and the aorta (the artery that distributes oxygenated blood to the various body parts). Aortic stenosis is a narrowing of this valve. 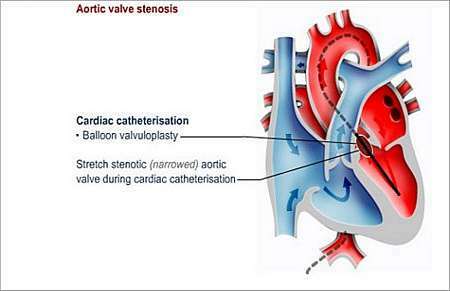 The stenotic (narrowed) valve causes the left ventricle to work harder in order to pump blood through the abnormally narrow valve . 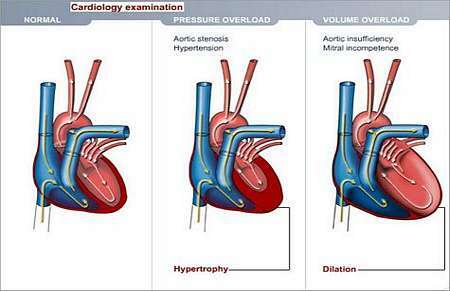 Working too hard may cause the left ventricle to get thicker and this may eventually result in heart failure. 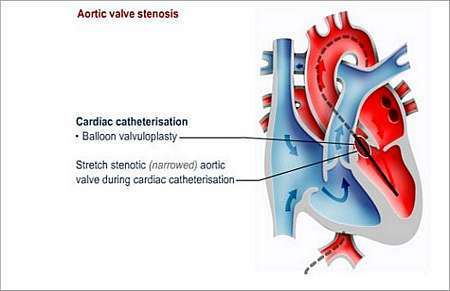 Congenital aortic stenosis is a defect caused by an abnormal development of the aorta valve during foetal life. This might be associated with a bicuspid valve (only two valve leaflets, as opposed to the normal three) or other variants. The end result is a narrowed valve that causes obstruction to blood-flow. The symptoms of aortic stenosis are dictated by the severity of the lesion. The majority of newborn babies and children with aortic stenosis do not experience symptoms. Pain in the chest during feeding. Excessive tiredness when physically active. Children with mild stenosis usually do not need surgery, but they should be watched carefully and visit their doctor regularly. Other cases may require balloon valvuloplasty or open-heart surgery. The narrowed aortic valve is stretched during cardiac catheterisation. 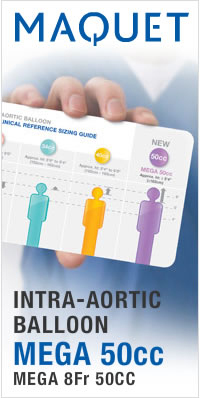 A "balloon" is guided into the heart on the tip of a thin tube called a catheter. When the balloon is inside the narrowed valve, it is inflated to widen the opening; thereafter the balloon and catheter are removed. Surgery may involve stretching of the aortic valve or splitting of the abnormal valve. Alternatively, it may involve cutting out some of the muscle within the left ventricle; this procedure is required when the obstruction is in the left ventricle outflow tract below the aorta valve. In other instances, it may be required to replace the aortic valve or even the complete aortic root (first part of the aorta, just above the aortic valve); this is called a Ross procedure. The aortic valve is replaced with the patients own pulmonary valve (pulmonary auto-graft) and the pulmonary valve is replaced with a tissue valve (by means of a human donor valve). Some patients may present with very complicated abnormalities that cause obstruction of the left ventricular outflow tract. These conditions require specialised and very complicated repair procedures. 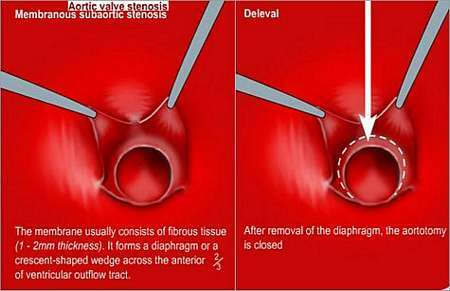 In some cases, after balloon valvuloplasty or valve surgery, the valve may narrow again. In this case the patient may, later in life, need complete valve replacement with an artificial valve. Children who have had valvuloplasty or surgery for a narrowed aortic valve need to be careful when doing physical exercise and refrain from taking part in extreme physical activities. Patients need long-term supervision because the aortic narrowing may again worsen over time, or the aortic valve may become incompetent (valve does not close effectively). It will be prudent for the patient to have regular check-ups with a specialist or follow-up at outpatient clinics. The patient will have to prevent endocarditis for the rest of his or her life. Endocarditis is an infection of the lining of the heart or heart valves.